What if – to find yourself – you had to run away? I have read a couple of Karen’s books now and what I have read, I have enjoyed. 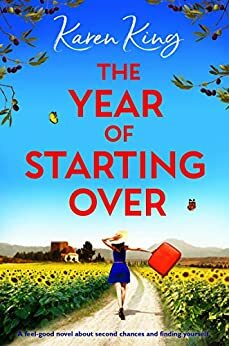 I read the synopsis for ‘The Year Of Starting Over’ and it sounded like just the kind of read I needed- light-hearted, fun, uncomplicated and uplifting. I couldn’t wait to start reading this book. Oh my word, I have to say that I thought that Karen’s other books were good but ‘The Year Of Starting Over’ blows them out of the water. I absolutely, totally and utterly flipping well loved, no make that ADORED this book but more about that in a bit. Holly is the sort of character that I would love to be friends with. Holly is kind, caring, gentle, compassionate, sensitive and funny but she does have a lack of self confidence. However where her boyfriend is concerned she has turned into a bit of a doormat and then some. He treats her like dirt, he goes out with his mates a heck of a lot despite the fact that he had previously said that he would spend time with her, he is reckless, he is irresponsible, he is thoughtless and he is a child in a man’s body as it were. He seriously sees nothing wrong with what he does and he always thinks that he can win Holly over by flattery, sweet talking and fluttering of the eyelashes. In fact he actually reminded me of the husband of a friend of mine. There were a few times where I felt as if I could have jumped inside the pages of the book to give him a good hiding with a wet fish. Happily, Holly woke up and smelt the coffee as it were. She decides to carve out a new life for herself and decides that she is going to be the person she wants to be and not the person that others want her to be. Will Holly manage to build a new life for herself? Will Holly find love and the happiness that she so deserves? Well for the answers to those questions and more you are just going to have to read the book for yourselves to find out as I am not going to tell you. For me, ‘The Year Of Starting Over’ has to be one of my top reads of 2019. I fell in love with the story and I felt as though Holly was a friend of mine. It didn’t take me long at all to get into the book and to become addicted to reading it. When I picked up the book for the first time I only intended to read the first couple of chapters but I was enjoying the book that much that I was still sat there reading over a dozen chapters later. The ‘author’s writing style is so down to earth and she grabs your attention from the start. I think a big part of the attraction for me is the fact that the main character has spent that long being putting other people’s needs and opinions first that she has forgotten her own if that makes sense? Well a therapist at the Pain Clinic I attend once said the very same thing to me. I thought that if Holly can get out there, make the most of every opportunity and take risks then I am darn sure that I can too. She is a kind of role model for me if you like although I know that will sound daft to some. I became obsessed with reading this book and the further I got into the story, the more I wanted to read and the quicker the pages seemed to be turning. I seemed to race to the end of the book far quicker than I thought. I had mixed feelings about finishing this book. Don’t get me wrong I was pleased to finish because at least I knew how the story ended, but I was enjoying the author’s writing style, the characters and the storyline that I just wanted the book to continue on and on. In short, I adored reading this book and it has to be the best of Karen’s books that I have read to date. The characters are realistic and down to earth, the story is definitely uplifting, realistic and plausible and the writing style had me hooked all the way through the book. It was a pleasure to read ‘The Year Of Starting Over’ and I can’t wait to read what comes next from Karen King next. The score on the Ginger Book Geek board is a very well deserved 5* out of 5*.